Rig-Talk • View topic - Welcome Larry, the mad scientist of high gain! Post subject: Welcome Larry, the mad scientist of high gain! Post subject: Re: Welcome Larry, the mad scientist of high gain! I'm taking really good care of your baby here in LA. Did you get a Larry Keith ? Hey Stephen, how you doing brother? playing it since I got it, for about a month now. I'm doing great. How's life treating you ? Thanks Stephen, yeah life is ok, Thanks for asking, although just a few years ago when I turn 50, The body starts to take its toll, aches and pains, and some major health issues over the last couple of years, but I am doing much better now. I figure life is short… Live it up, it’s later than you think! So I bought a Larry Dino, and from the first note I played through it I am completely ecstatic with it! Last edited by SQUAREHEAD on Fri, Sep 28, 2018 1:13pm, edited 1 time in total. I would be into trying a Larry. One of the few I have not played on. Welcome to the forum, Larry! I love the sounds that I heard in the clips of the Dino 962 amp head. Unfortunately, I've never seen, heard, or played through a Larry Dino 962 amp head in the U.S. The sounds are good to me and the build quality is excellent. Do you plan on having a U.S. distributor in the western United States? Thank you and welcome to you also! I love the sounds that I heard in the clips of the Dino 962 amp head. There are no clips of the DINO 962 yet, nowhere. These clips meanwhile absolutely aren't reference of the sound quality of my current DINO 939 and DINO 962 models. Unfortunately, I've never seen, heard, or played through a Larry Dino 962 amp head in the U.S. The sounds are good to me and the build quality is excellent. Do you plan on having a U.S. distributor in the western United States? No I don't plan to have a distributor in the USA anywhen in future, because my annual output of amps is much too low. But soon I can give you the contact of someone in Orlando/FL, where you can try a DINO 962 in his studio. Its called the ARES 3-C. In essence its a Dino. 3 independent channels with an additional 'mode' on the clean channel gives this 4 distinct tones overall. 4) Scream + (SCR plus) - basically a slightly revoiced Scream channel with some BHR like upper mid grind dialed in and tighter lows compared to the creamier, more liquid stock Scream voice. It’s like looking at a rare piece of art! Once Again I have to check my bucket list of amps. Your in the top 3. I still have 2 amps in my jam room I haven't taken out the box yet. Been over a month or so. Seems the older I get the less desire to play. But still love the Thrill of the Chase!! Wow. Beautiful works of art there. 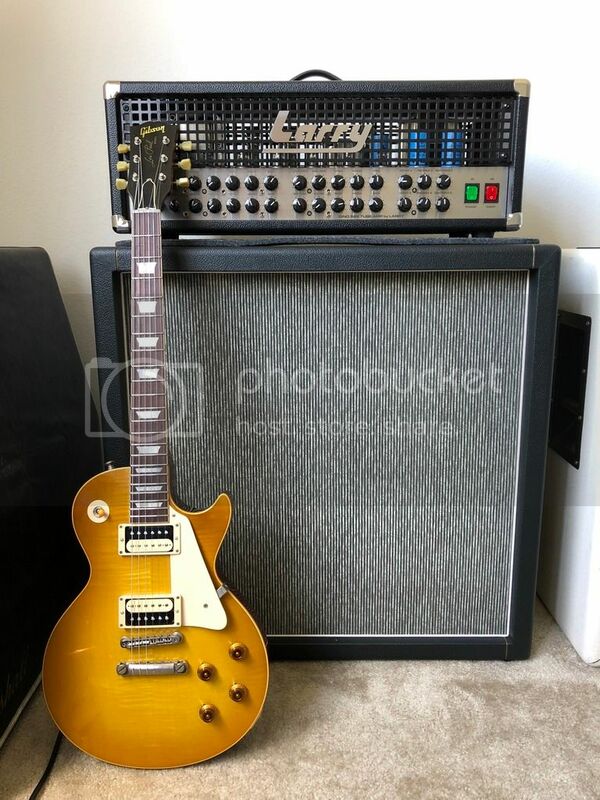 Anyone else here with a Larry amp? No but maybe I should. Which OT is that Gary? That amp is sick Any clips yet? SKOT transformers, made with very old core material for authentic early 80's tone. He's using a different company now but with the same materials. OT is standard one as used in a Dino, but the PT is beefed up with stronger primary and heater winding to accommodate the 6 output tube design. I own a Dino Preamp from the 90ies. A great amp with four channels/sounds!